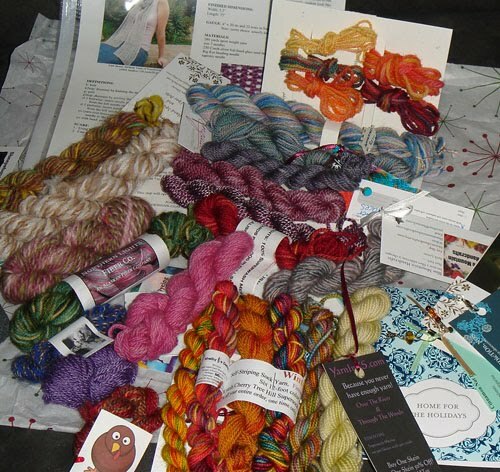 Congratulations to DgitalMisfit for winning the Touch Yarns pack, and to BibandTucker for winning the FabFibres pack! Today I'm featuring a new NZ yarn producer called Grrrl Shaped Yarns who has just set up business and is joining in the NZ Yarn Sampler Box! Brooklynne has some amazing yarns - I have my eye on the Pukeko colourway, 50/50 merino/silk. But I also love My Grandmother's Quilt (and it does look like a quilt my grandma made!) - and a bamboo/merino blend sounds divine to knit with. I'm about half way through knitting up all the patterns for my upcoming sock book, so I might have to buy some Grrrl Shaped Yarn to knit up a cool pattern to use for photography in my book! We are very lucky to have two giveaways this week - details below for Touch Yarns and also Fab Fibres. Enter both! Competition ends Monday 30 Nov at 9pm NZ time. Wow, Touch Yarns are giving away this beautiful 100g skein of 2ply wool (that's 900m! ), and a cute baby singlet pattern to knit. I love this colourway, it's just gorgeous. The prize will be randomly drawn from all entrants in the comments on Monday Nov 30 9pm NZ time. Good luck! Ooh how exciting - you could get your hands on this super sparkly goody bag from Fab Fibres! The prize is a skein of 5 assorted turquoise yarns and threads (2 metres each), a 10 metre hank of thick gold metallic thread, and a sample of turquoise/blue/black wool paper. Perfect for making your Christmas craft creations even more special. When I opened the box of Fab Fibres samples, it was like opening a box of treasure! You are going to love these samples. Each bag contains 3 colour co-ordinated yarns - an assortment of 5 different thread (2m each), a 10m hank of metallic yarn (perfect for knitting feature stripes on the Christmas stocking patterns I'm currently working on), and a sample of handmade wool paper. 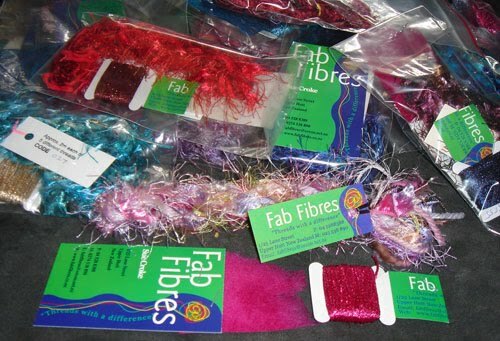 Fab Fibres is where you go to get amazing supplies for whatever your handcraft talent is. Check them out - and their fabulous Treasure Packs for $30 would make great Christmas presents for your crafty friends. 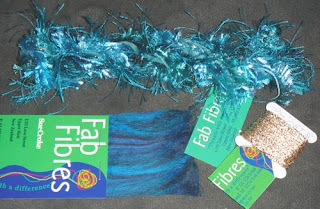 Fab Fibres was created to fill a niche of providing textural threads, initially for embroidery but also for general craft use, such as scrapbooking, tassels, embellishments, cardmaking, costume design and lots more. All threads are commercially manufactured. The product range has gradually increased to include handmade fibre papers, collections of fabrics and threads, and most recently packs of textural yarns for freeform knitting/crocheting or "scrumbling". I just got this in the mail today! It's the PhatFiber Sampler Box from the US. Exciting! 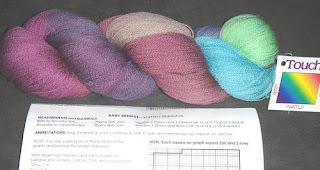 This is the type of thing you can expect from the NZ Yarn Sampler Box, although of course from mostly NZ crafters. We also have knitting accessories too. Check back soon for more sample photos as they arrive! 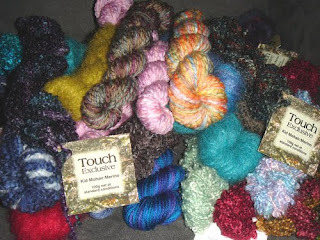 I'm very excited to have Touch Yarns be a part of the NZ Yarn Sampler Box - take a look at their beautiful samples! They are all different, so whatever gorgeous wool features in your box will be a big surprise. The samples include Mt Pisa merino, Merino Slub, Kid Mohair/Merino, 12ply superfine kid mohair, 8ply merino. And they are all a very generous size, so you can have a good play with it before buying a full size version from their website. Touch Yarns are from Central Otago, where inspiration has come from the stark beauty of thyme fields, mountains and the historic goldfields. They have a huge variety of wonderful yarns - 2ply, 4ply, 8ply, 12ply, 14ply, and a collection of amazing patterns so you can knit up something truly special. Visit Touch Yarns now and see what inspires you! Cute cute cute!!! These little badges arrived today from www.nutandbee.com They are a happy little ball of yarn with knitting needles - this would be the perfect accessory to top off your latest knitted hat! 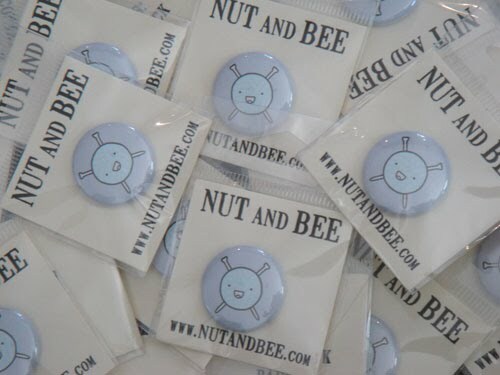 Nut and Bee is a range of character goods designed and made by Annette M. Russell in Auckland, New Zealand. Check out their website and get all your non-knitting Christmas shopping done in one spot - they have an amazing selection of cute stationery sets, notepads, rubber stamps, stickers, magnets, badges - and all feature sweetly drawn friendly animals and objects. Thanks for the entries - I know there were lots of others (i saw a few around the place) but I only selected random entries from those listed on the comments. 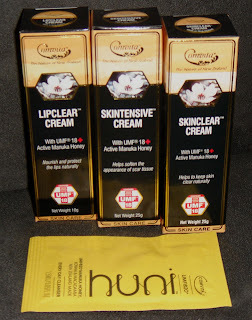 Here are the winners of the Comvita Skincare packs - please email me at blendy@blendy.co.nz and tell me your postal details. Don't forget that each sampler box will also contain one of these sets as well, worth $42. Today the beautiful samples from Anzula arrived! And it is sock yarn - my favourite kind of yarn. But this is extra special - it is 50% superwash merino and 50% silk, and has the most beautiful texture. I can't wait to knit this up! The name is perfect for the colourway - "Full Bloom, like knitting a vase full of hydrangeas". I have hydrangeas this colour in my garden, just starting to bloom, so in a month or so, I'll have to take another photo of the samples with my flowers! Anzula have been very generous with the number of samples provided, so I would say almost all boxes will contain this delicious yarn. You should also check out the large range of other yarns available at the Anzula store. 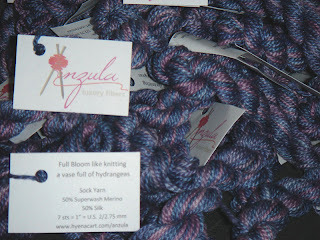 Anzula is one of the specialty international suppliers to the NZ Yarn Sampler Box. I know it's not knitting related, but it is from New Zealand, and I'm sure all knitters would love to try some free NZ Skincare products! In my 'other' life, I'm a nutritionist and naturopath at www.absolutehealth.co.nz, and my friends at Comvita have donated some wonderful UMF18 Manuka Honey skin treatments - EVERY BOX will contain a Lipclear Cream (great for coldsores as it also has lysine in it, SkinClear Cream (perfect for problem skin) and Skintensive Cream (to help with scar healing), and a sachet of Huni Every Day Cleanser. This set of products retails for $42, so this is an amazing bonus addition to our Yarn Sampler Boxes! Anyone can enter (I'll post your prize to any country), and the competition ends on Friday November 13 at 9pm NZ time. Don't forget to sign up to be alerted when the boxes go on sale! 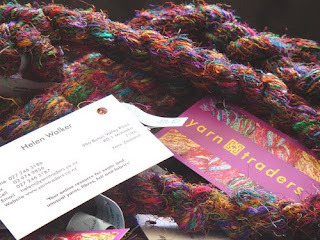 Wow, look at the beautiful yarn samples that Yarn Traders have supplied! 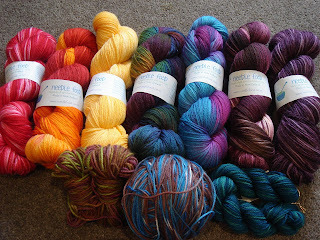 I am so excited to have these in the NZ Yarn Sampler Box. They are something really very special - recycled silk sari yarn. It is called Annapurna, and is 99% silk, hand spun in India. Each 25g skein is like an electric rainbow, with incredibly intense colours! I've never seen such an exotic yarn before, and Helen at Yarn Traders is being extremely generous and wants every Sampler Box to contain some beautiful sari silk. It has come to my attention that I have quite a few beautiful skeins of Needlefood yarn. So I thought I'd take a picture of my collection. This excludes completed projects, as they've been knitted up into socks from patterns for my upcoming sock book!